Though we may be acquainted with tandem variety of a bicycle built for two where the cyclists are positioned fore and aft but we were hitherto unfamiliar with an alternative configuration known as the Sociable or the Side-by-Side (das Nebeneinandem). Historically employed as a courtship vehicle, the design is credited by some to Australian sportsman, engineer and politician Sir Hubert Ferdinand Opperman, who incidentally was the object of international disdain after garnering the reputation as a cheater for doping for his trials in the Tour la France and other feats of endurance, heralded in the press with the saying “un beau mentir qui vient de loin,” a good lie comes from a great distance. Though always maintaining that “there is no sporting prize worth the use of drugs or stimulants,” Opperman competed at a time when the practise was endemic and an assist for a truly heroic effort was generally a forgivable offense. 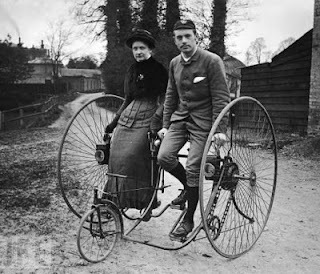 One’s intent could also be misconstrued when sporting such a contraption. I wonder if it was possible for some cad to going cruising and operate the craft solo—or if a willing partner was required to propel it.